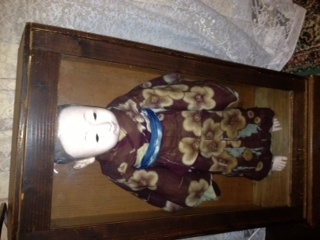 I recently purchased a Japanese doll, male, in a kimono. There are no markings. He is in a wooden Jarrah box with a front glass front. The Kimono is a dark brown with white flowers and bits of blue on them.It has a blue sash around he chest. His hair is moulded. The arms, legs and head is bisque I think. His body is strawed filled. He has glass eyes. The lining inside the kimono is light blue. Could someone help me please?